Teaching students to “think like a scientist” is a tricky thing. Many of us have experienced science classes that required memorizing seemingly irrelevant from ancient textbooks. On the other hand, other activities include spectacular demonstrations or hands-on activities, but do not lead students to scientific understanding, operating more than a magic show than a lesson. Helping students, who are (at least in most cases) unlikely to make bone fide scientific discoveries, understand both science content and the processes that allow it to be discovered, requires a deft hand. 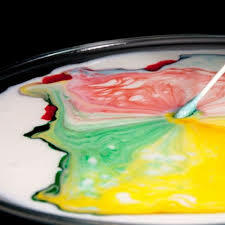 Sometimes science activities have particular potential to support students’ scientific thinking. Sometimes experiments are a lot of fun. Steven Spangler’s Color Changing Milk is both. Take a look. There are several versions online. Here is a relatively short one presented for television. One of the best things about this phenomenon is that it presents a wide variety of options for students to design their own experiments. Don’t show students the whole video. Either show just the first minute or, better yet, do the demonstration yourself. Talk about the interactions of fat molecules. Make sure students, at an age-appropriate level, understand what is going on. This is not a principle that can readily be discovered–it needs to be explained. Scientific reasoning needs a basis of understanding on which it can be built. Only then does it make sense to help students think about how the variables could be altered. It is one thing to randomly drop color in liquids. It is another thing to have students think, “If this is caused by the action of fat molecules, what would happen in skim milk, with the fat removed? What about cream, with lots of fat?” What about oil? Would that react in the same way? What about different types of coloring? Do they all react in the same way? This train of thought is basic to problem finding in science and allows students to build on the activity in ways that parallel genuine science as opposed to random play or the follow-the-recipe tone of many lab activities. Both genuine play and following directions have their place in science, but good problem finding happens in the space between them. Have you found a science activity that is particularly effective for helping students generate their own questions? We’d love to hear about it.